Some of the Cosmetics à la Carte products. Honestly, this image does not do the range justice! Last Thursday, the 22nd November, I had the fortune to be invited along to the Cosmetics à la Carte launch in the brand spanking new and very shiny Vedas Beauty out in Dun Laoghaire. It was a lovely night, filled with two different champagnes, red and white vino, more canapés than you could shake a stick at (why you'd want to do this, I don't know) and overflowing glasses of sparkly (water, which I was on, as I was driving ;-)). So why, after the launch, do I now find myself a Cosmetics à la Carte convert? 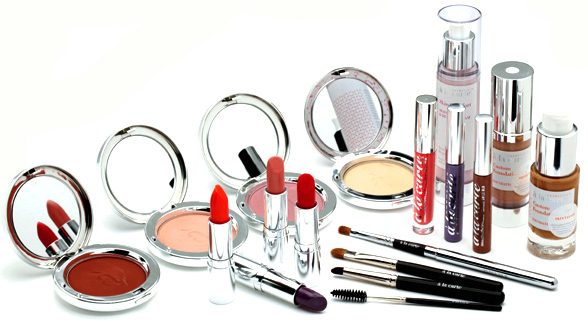 Cosmetics à la Carte is a particularly unique make up brand. Born in 1973, the brainchild of two Cosmetics R&D chemists (Lynne Sanders and Christina Stewart (Ms Stewart has since retired from the brand)), it then, and has since, specialised in the concept of "bespoke beauty", whereupon your individual foundation shades (and finishes) could be customised. Whereupon everything is and always would continue to be hand-made, from their labs in the centre of London. Whereupon no product would ever be discontinued (and if anything today is not available in-store, there's an extensive back-catalogue of products that they are more than willing to make up for you) - in this day and age of LE products and discontinued brands, this is a breath of fresh air - I love this notion. Whereupon if you suffer from an allergy to an ingredient that is contained in one of their products, they will create a version of the product for you minus the bothersome ingredient. How wonderful is all of this? Another service that Cosmetics à la Carte also offers is that of custom creation of products. You can send them a pantone colour. Or a scarf, a poster, a piece of fabric... and ask them to colour match a product to it. You can send them a discontinued lipstick or eyeshadow or blush (even from a rival brand) and ask them to recreate a version of it for you. And they will. From my chats with the founder, Lynne Sanders on the night, I get the impression that Cosmetics à la Carte are happy to go the extra mile for a client, because the vast majority of the launch attendees were well-heeled ladies who are longterm happy repeat clients of the company. Price-range-wise, this brand is not expensive. At all. When you consider the bespoke, handmade nature, the customisation, the personal attention to detail, and the personal attention to, well, attention! On the night I purchased three items; the iconic Skin Veil primer (which I've been dying to try), the Secret Light concealer and the Hydra Lift eye gel; I wanted to purchase so much more but called it a halt at that point. The three of these together were just over €100 - by no means are these products ridiculously priced. On the night, there were two demonstrations, one given by Cosmetics à la Carte's chief Makeup Artist, Jane Sinclair and one given by Zoe Clarke, a highly respected Irish-based makeup artist, who had personally invited me to the launch. The demos featured two different takes on the Marilyn Monroe inspired look for both younger and more mature skin. The looks were equally beautiful, tying in nicely with Cosmetics à la Carte's ethos of Ageless Beauty. We also all received goodie bags that featured some lovely freebies from Vedas/Cosmetics à la Carte: a full sized Divine Lash mascara in Black and a full sized Brow Ink in Sable. I'm looking forward to trying these out. I already had a Brow Ink in Taupe from the November 2011 Carmine box and I've been absolutely loving it for creating highly natural-looking brows. I want this lippie. I want, I want, I want. Yes, I am stamping my foot as I type this. The range has been recently re-branded and features custom skincare products, different types and finishes of foundation, powder, blush, lipstick, lipgloss, eyeshadows, concealers, correctors... The flagship store is based in Knightsbridge and I'm really looking forward to a visit when I am in London soon next week. Make Up For Dolls Blog is One Year Old!